We’re staying over at a hotel at Kew, so it seemed like the perfect opportunity to visit The Royal Botanical Gardens. It was a beautiful, sunny day and although the car park was packed, the gardens themselves were fairly crowd free; attesting to their grand scale. Lucy and I enjoyed a hot dog snack on one of the lawns beside a path and we watched passersby … er … pass by. Unfortunately we didn’t visit any of the justifiably impressive glass houses. 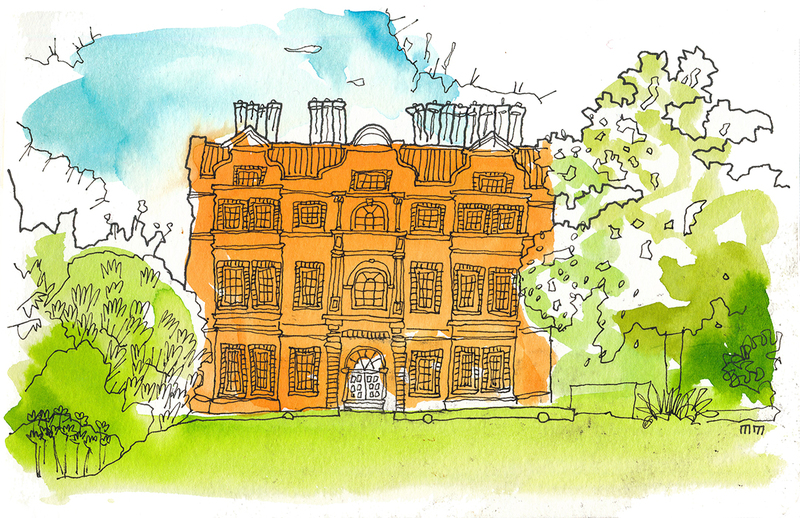 But Lucy and Caroline did visit Kew Palace. My regular Sketchcrawl group were having a meet up today where they were practicing putting paint on their paper before marking in the lines, so I thought I’d join in whilst my family sauntered round the palace. I sat with my back to a sundial and quickly sketched. Luckily it was a bright, sunny day – so my paint dried quickly enough for me to start drawing in the palace’s many, many windows. 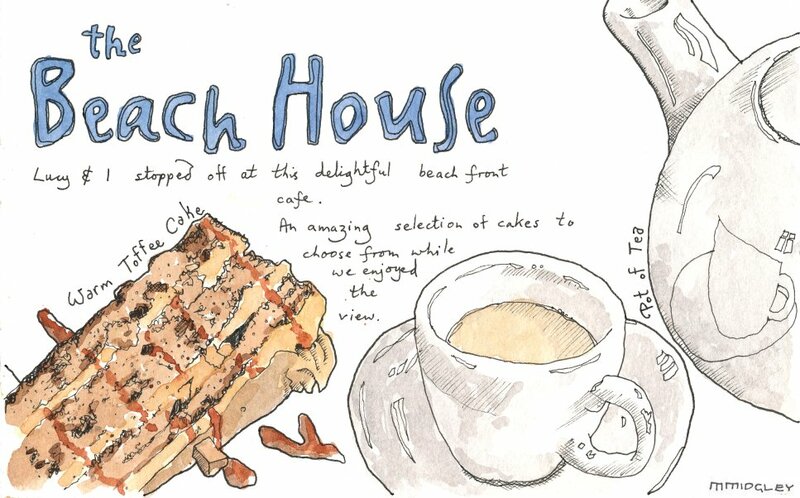 Last Saturday the Sketchcrawl North group met up at the Harland Cafe in Sheffield; for a drawing extended lunch. I made sure I got there a little earlier so that I could have breakfast as well, knowing that i would spend a little amount of time drawing it before I ate. There were soooo many tasty sounding things on the menu, for lunch; I just couldn’t decide what to have! In fact, I actually abdicated responsibility on that decision and asked the waitress what she preferred. So I have a vegetarian sausage and fried egg sandwich., Yummy! I don’t usually have puddings or cakes; so for me it has to be something particularly special.